BLANDING—The Manti basketball team earned a convincing 85-59 win over North Sevier last week, but came up short against the fourth-ranked San Juan Broncos on Friday, losing 76-69. 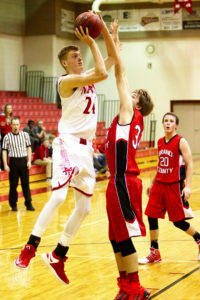 At North Sevier on Wednesday, Jan. 18, Tanner Rasmussen got the Templars rolling with eight first-quarter points. Manti was nine of 11 from the line in the first eight minutes. The Templars led 22-13 after one period and 48-34 at the half. Manti owned the second half, outscoring the Wolves 37-25 for the 26-point win. There were 11 Templars in the scoring column, led by Matt Nelson who came off the bench for a team-high 20 points, nine from three-point range. Rasmussen finished the game with 16. Corbin Linam, Dylan Wathen and Kade Nicholes had eight each. Riley Curtis added seven; Mac Stevens had six points and a team-high eight rebounds. Brenton Thomson and Kole Brailsford had four each while Sam Benson and Adam Huff had two each. In Blanding, things started well for the Templars, who took the early lead 22-15 after the first quarter. Sadly, the Broncos evened things up in the second and regained the lead 43-40 at the half and never looked back. Curtis led the Templars with 19 points, 15 from three-point range. Stevens and Linam had 12 each in the loss. Nelson was the fourth Templar in double figures with 11, Wathen had six, Brody Barson had a three-pointer. Huff, Rasmussen and Brailsford had two each. This week the Templars will host Emery on tomorrow. The Spartans are the top-ranked team in 2A basketball with an overall record of 15-1. Last time these two teams met, Stevens singed the nets for a game-high 21 points, but it wasn’t enough as the Spartans earned a 10 point win. The loss at San Juan gives Manti a 2-3 region record and has the Templars in fourth place in Region 15. Emery is in first at 5-0, San Juan second at 4-1, Grand third at 3-2, Gunnison fifth at 1-4 and North Sevier sixth at 0-5. The top four teams will earn the right to participate in post-season play.